You might get the impression from reading interior design articles that the idea of an accent wall is a relatively recent concept; but actually making a feature of just one wall in a room has been popular for decades. 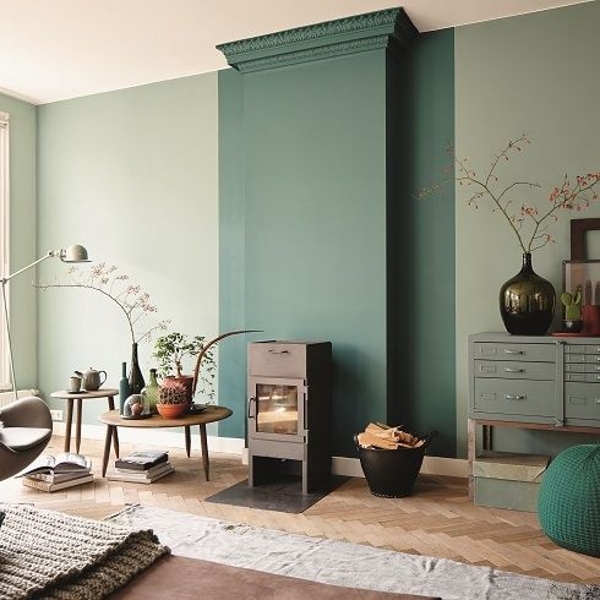 What has changed is that there are now more and more fun and interesting accent wall ideas, as decorators push the limits beyond traditional paint or wallpaper. Below we feature over 30 different accent wall ideas to get your creative juices going – a quick search online will bring up thousands of examples for further inspiration. 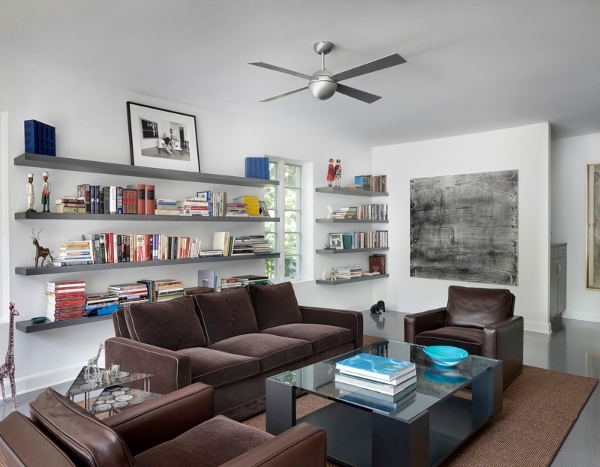 But first, let’s just look at why accent walls are so popular, and why opting for one might be good for your project. 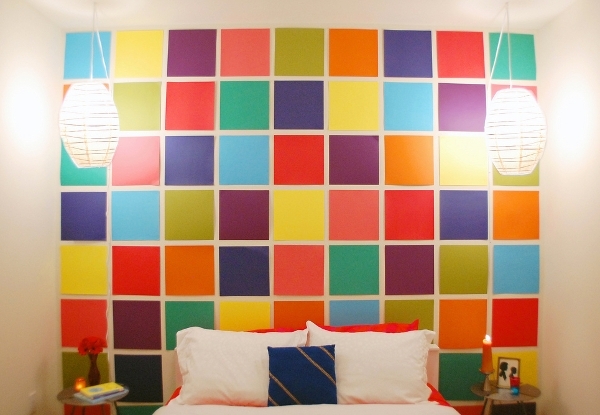 For a start, accent walls are the perfect way to experiment with color and pattern in your home. The advantage is that by just featuring one wall you can test an idea without fully committing or overwhelming the space. This is particularly useful if you are keen to try bold accent wall color ideas: if you paint just one wall bright fuchsia and then decide it was a mistake, it wont be too expensive to paint over. 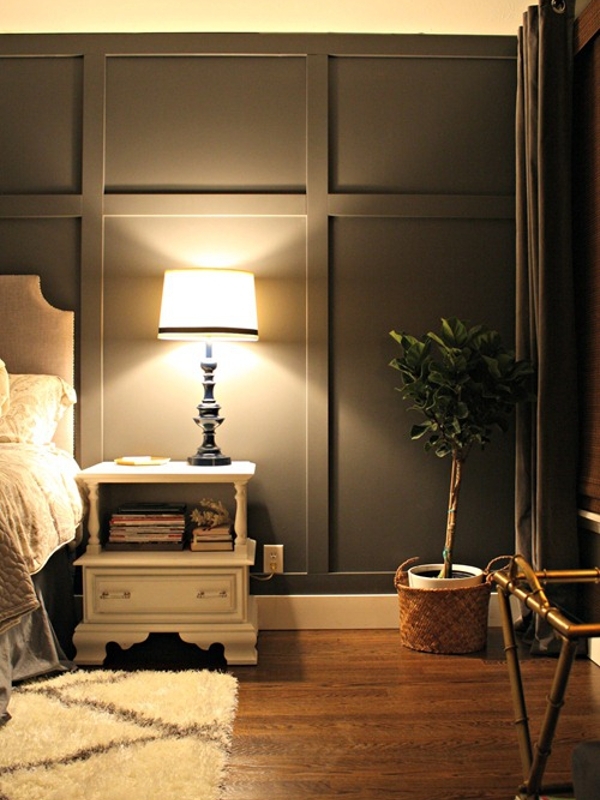 Accent walls are also a great budget-friendly way to refresh a room. There are some truly amazing DIY accent wall ideas that will only cost you a few dollars to achieve. Depending on your level of skill, an accent wall can be simple – there are lots of fun accent wall paint ideas that simply require a can of paint and some masking tape – or you can show off your artistry with a unique hand painted mural. Accent walls can be featured in any room, and as with all interior design, there’s an accent wall idea to suit your taste. Perhaps you prefer a more traditional accent wall that features a classy wallpaper in your living room; or you are really into alternative trends and want to explore wood accent wall ideas; or fancy trying one of the luxurious accent wall ideas for your bedroom, such as a mirrored or upholstered wall? The main point of an accent wall is to provide focus to the space but the possibilities are limited only by your imagination: so let’s get things going with a look of some of the best accent wall ideas we could find. WallpaperWholesaler.com claims to have over 300,000 patterns in stock – and they are only one of many online wallpaper retailers! That’s a LOT of wallpaper – and that’s what’s so great about choosing wallpaper for an accent wall: the options are endless! Choose a paper that compliments your overall design scheme with a background color that matches your other walls for a polished finish. A growing trend in recent years, specialist companies are now able to turn just about any picture into a giant wallpaper mural – even your own personal family photo. A lovely accent wall idea for relaxed family rooms. 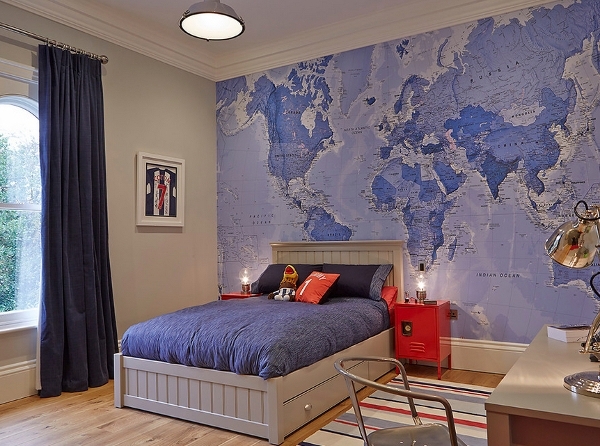 A smart idea for a kid’s bedroom or playroom accent wall: a huge world map mural that applies to the wall just like regular wallpaper! Add your own stickers or photos to mark places where you’ve visited or where friends and family live. 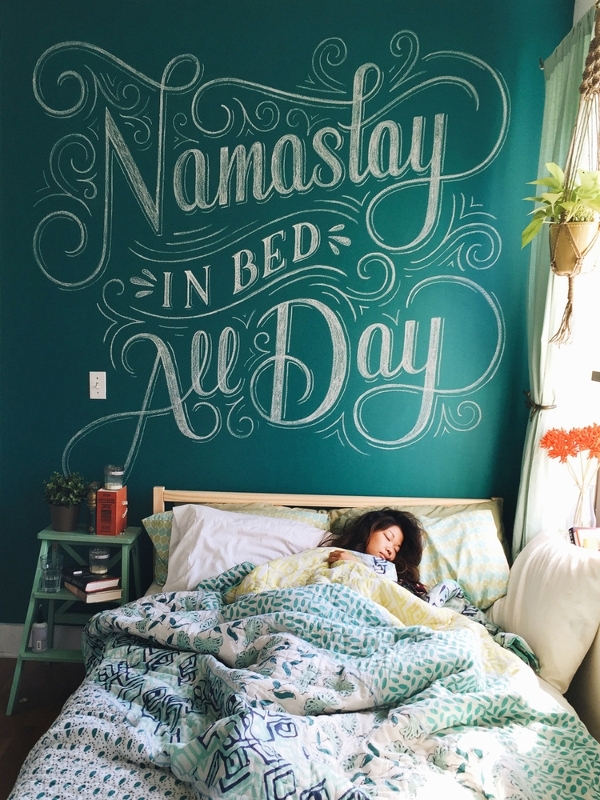 A wall decal sticker is the perfect accent wall choice if you really, really don’t want to over-commit! Just peel it off when you get bored and want to change up your décor! One of the easiest accent wall ideas to achieve is to pick a bold paint color, keeping the other walls white or cream for added emphasis; one block of color is good for accent walls in living rooms to highlight patterns featured in the soft furnishings. A pro graffiti artist was drafted in to create this brilliant graffiti accent wall – you can also get graffiti style wallpaper murals to create a similar effect. 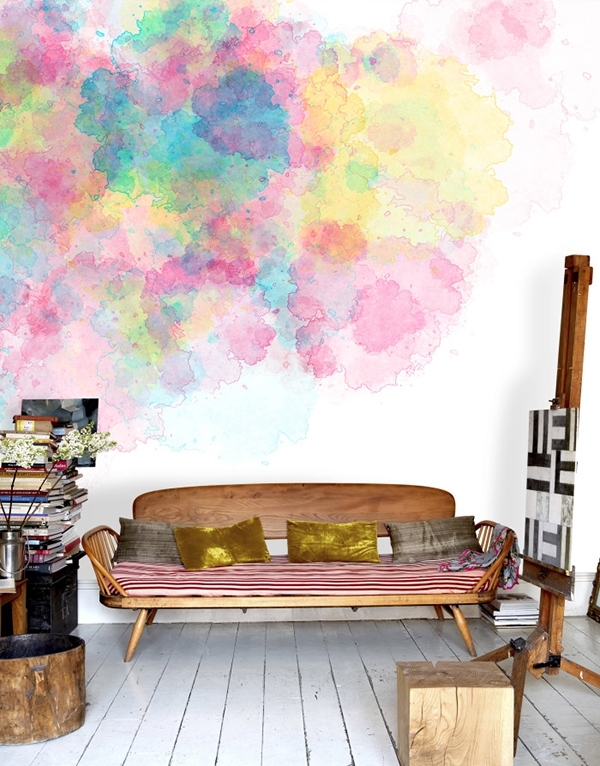 There are several online accent wall idea tutorials showing you how to do abstract paint effects like this one; or you can actually buy wallpaper now with pretty watercolor patterns like this one. Using stencils to create a pattern onto your accent wall is a wonderful accent wall paint idea that is really easy to achieve: you can purchase intricate stencils from online retailers, or make your own simpler versions with cardboard. 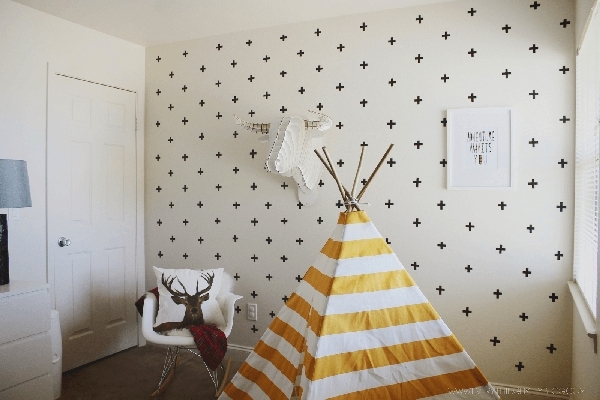 This is such a great accent wall idea if you’re on a tight budget or are renting and can’t make too many changes: just get colored washi tape and apply in pattern formation; check online for more fun washi tape accent wall ideas. 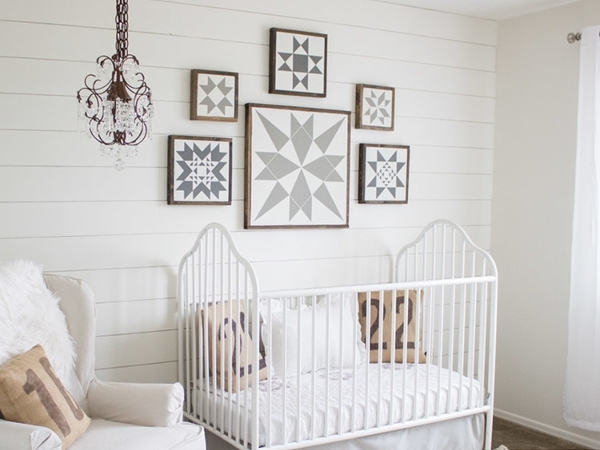 Cladding an accent wall in pallet wood is a huge trend right now! And what’s great is, depending on how you style the rest of the room it can work just as well for rustic, industrial or cool contemporary interior design styles. A slightly less rustic wood accent wall idea is to use shiplap siding – which gives your room a more country, farmhouse chic feel to it. Tongue and Groove siding could be used here too for a more cabin-like feel. 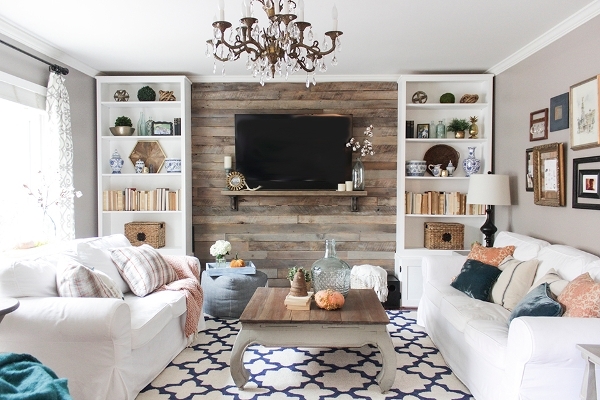 Go a step further with rustic wood accent walls by covering one wall with cedar shingles! 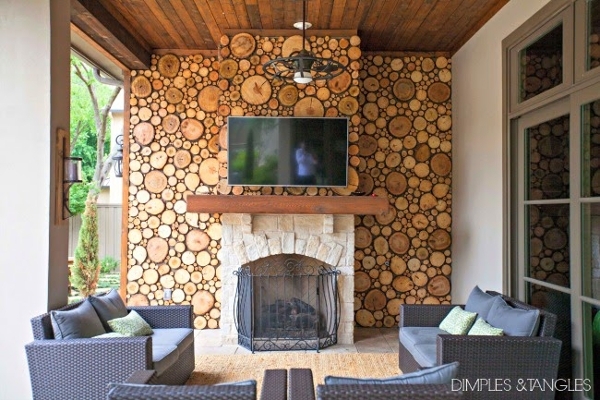 And for peak rustic wood accent walls, how about using wood slices?! 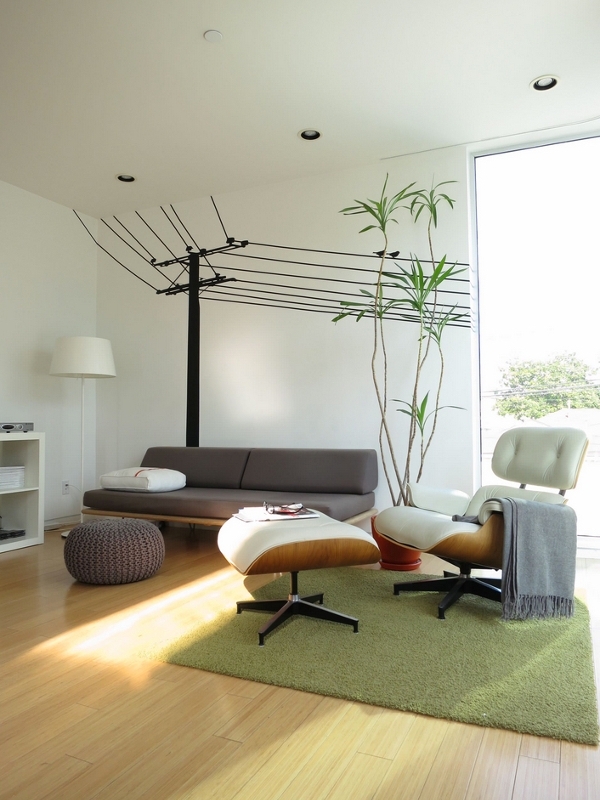 A fantastic accent wall idea for a patio or for a modern ranch house. For something more sophisticated, create a discrete accent wall detail by using picture moldings, painted in the same color as the rest of the room. 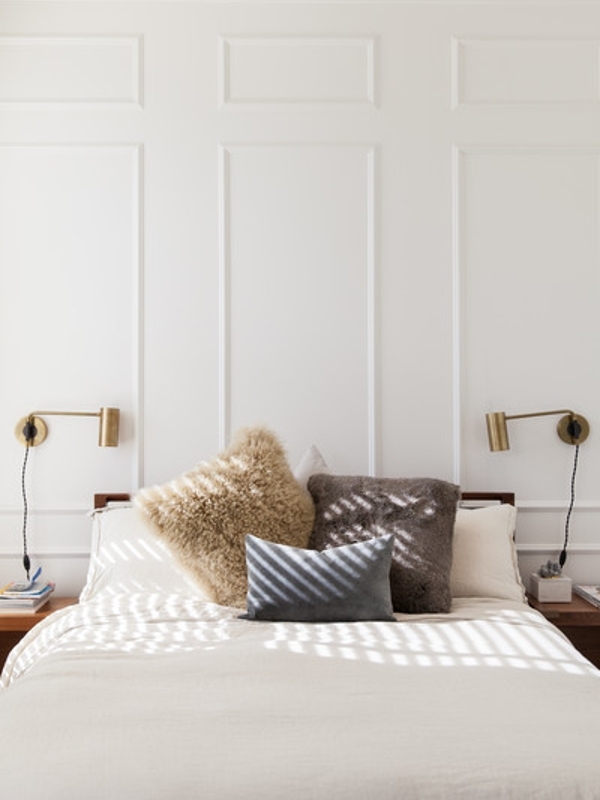 And for a more structured look, you can add board and batten to a feature wall – the shadow lines and highlights that appear at night really bring this look to life. 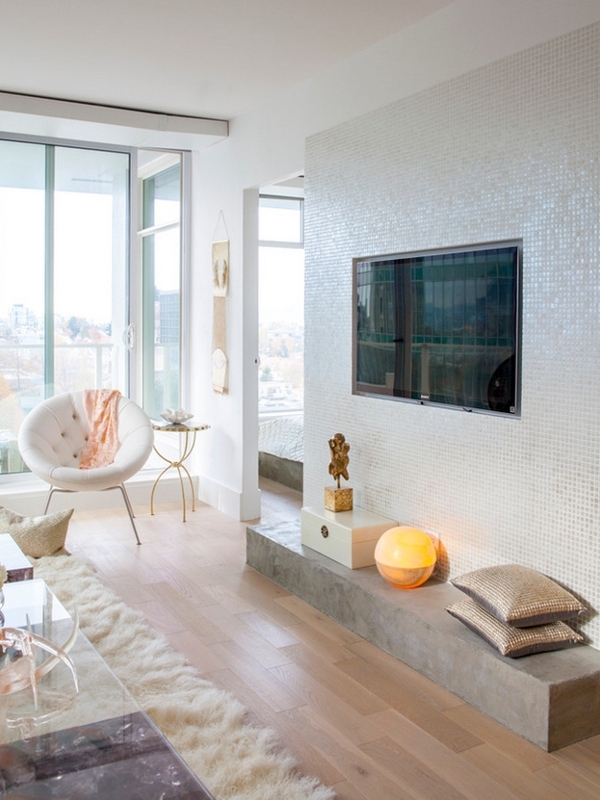 Ceramic tiles are typically used in bathroom accent walls, but there’s no reason why you can’t also use them in other rooms like in this living room where pearl mosaic tiles add a shimmering accent around the inset TV screen. 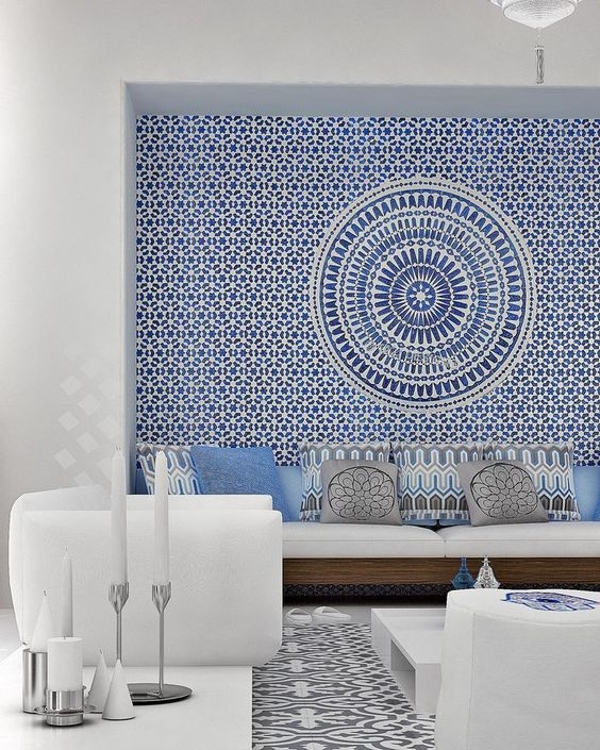 Superb Moroccan-style, shaped ceramic tiles have been used here to create a fabulous feature – a wonderful, big statement accent wall idea! 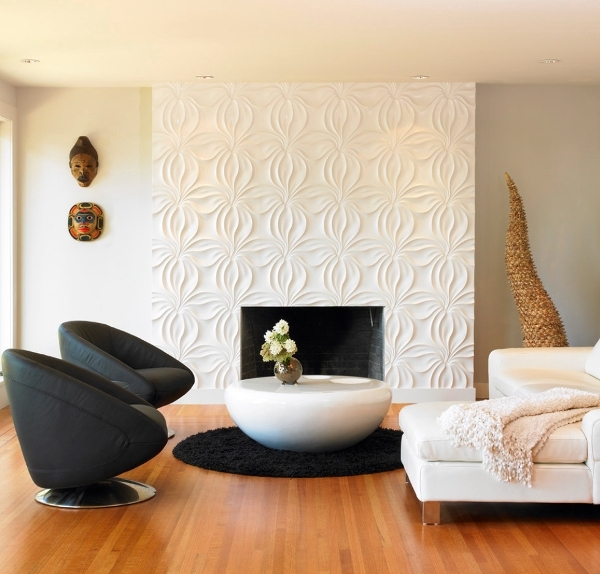 That incredible textured design around the fireplace is actually one of the fantastic 3-dimensional tile panels from modularArts. Here they have been used to make a feature of the fireplace surround, but could easily be used for a whole accent wall too. This super colorful kitchen accent wall idea has been created using vinyl tile stickers (yes vinyl stickers!) 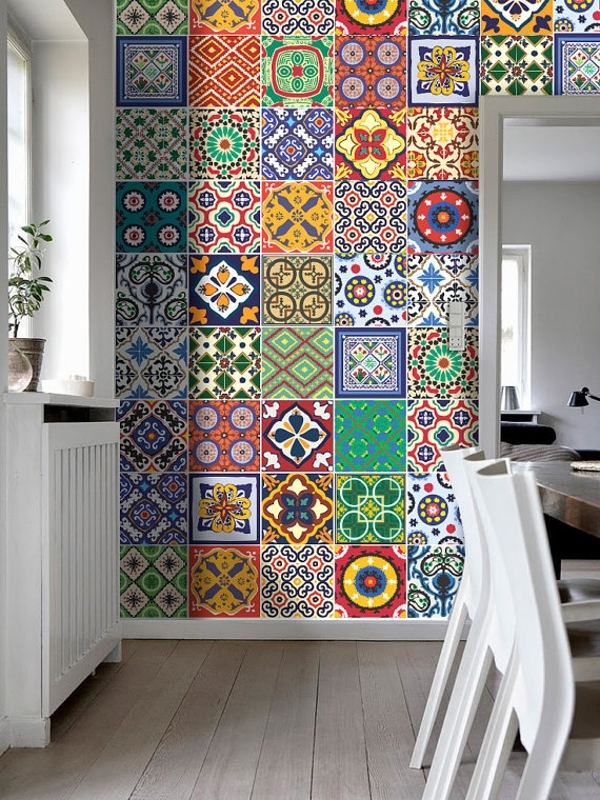 inspired by Mexican Talavera ceramic tile patterns. 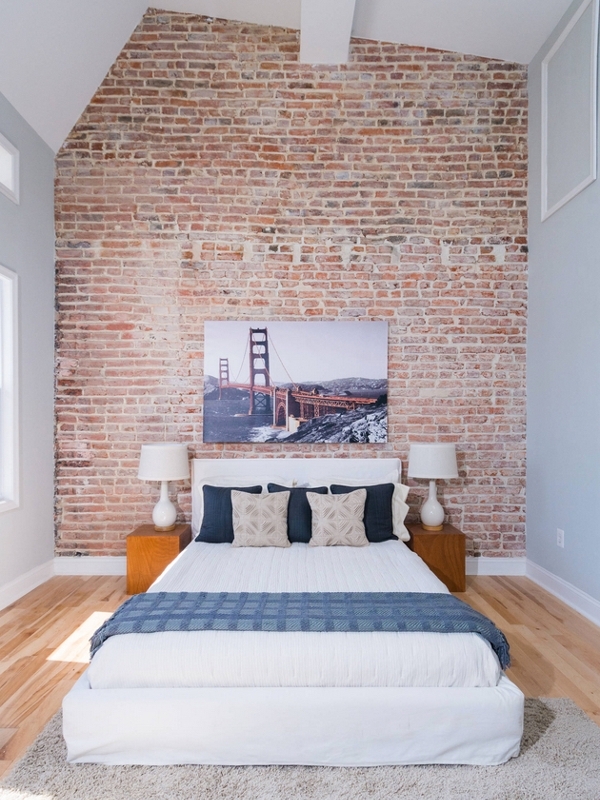 For a more pared back look, simply allow exposed brick to feature as your accent wall. 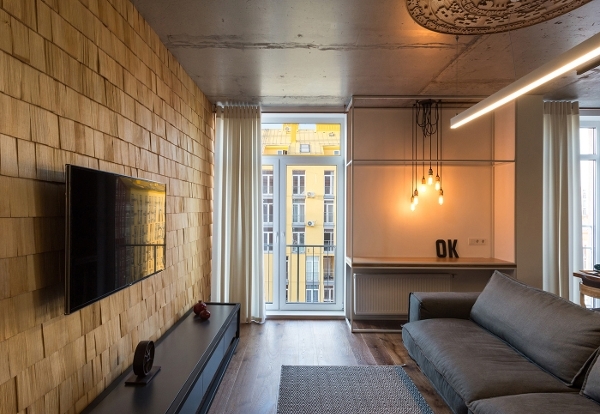 Usually associated with an urban, industrial aesthetic, exposed brick accent walls are equally at home in a more co-coordinated, contemporary design. 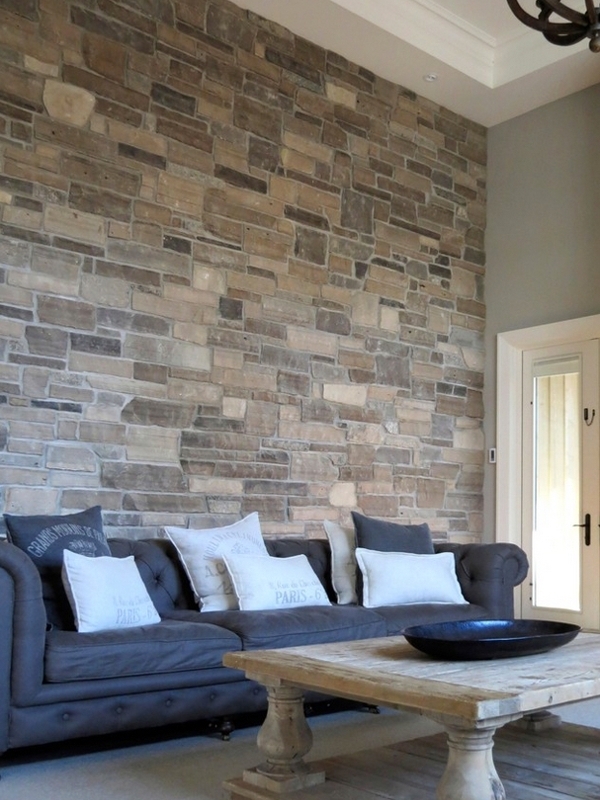 Recreate the vibe of a French Provencal farmhouse with an exposed stone accent wall: with increased realism in today’s stone veneer products, you don’t even need to have an actual stone-built farmhouse! A very useful budget-friendly accent wall idea is to use floating shelves: at the same time as creating a visual feature in the room, you’re also creating useful display and storage area for your favorite books and ornaments. 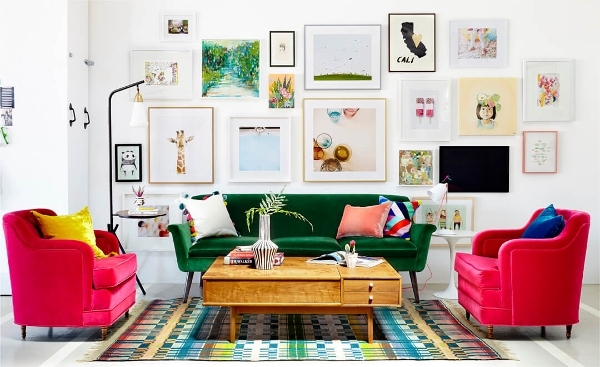 This joyful living room accent wall idea makes excellent use of the owner’s art print collection; keep picture frames a similar style and thickness to give your personal gallery a professional finish. 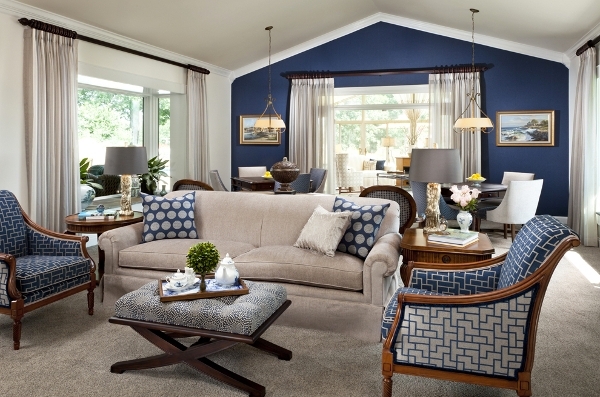 A perfect idea for an accent wall in a family room is to cover the space in family photos and inspirational messages! So simple, yet so effective. The owner of this rented apartment has taken brightly colored squares of paper and simply adhered them to the wall with tacky dots! Brilliant! An accent wall painted in a matt paint is the perfect background for an inspirational or whimsical statement: use chalk and pretty typography for maximum effect. 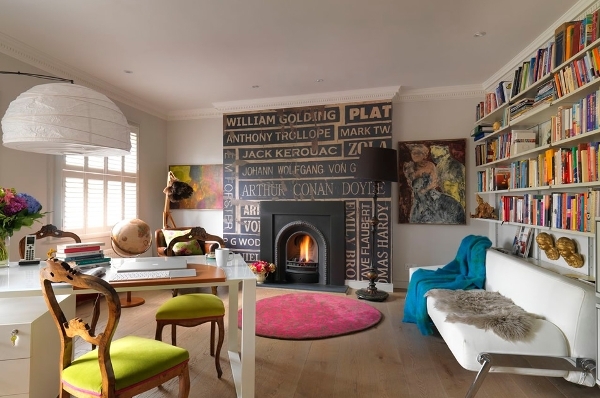 If you’re not up to recreating typography by hand, then there are plenty of wallpaper panel options available for your accent wall, like this distressed billboard effect one featuring names of literary figures – ideal for a home office or library. 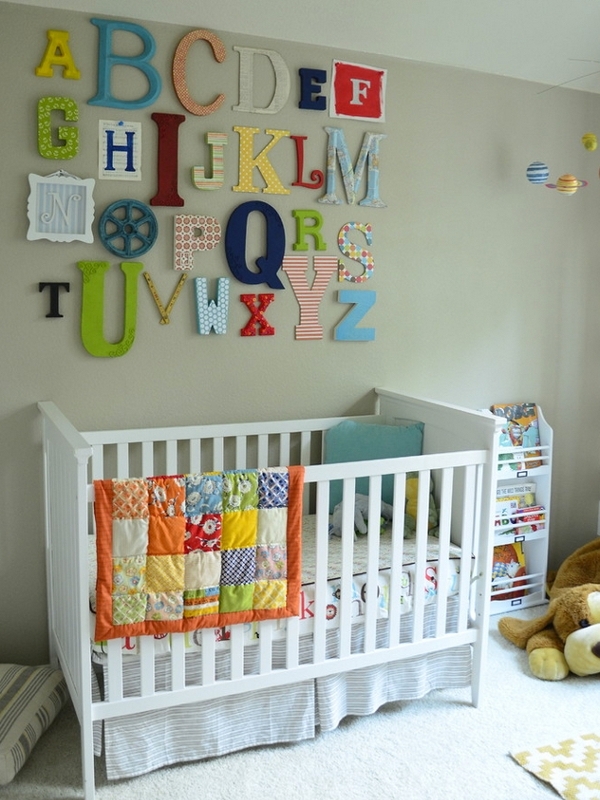 This alphabet accent wall idea uses different typography prints and objects, in 2D and 3D form, to give a quirky, cute and unique touch to a baby’s nursery. 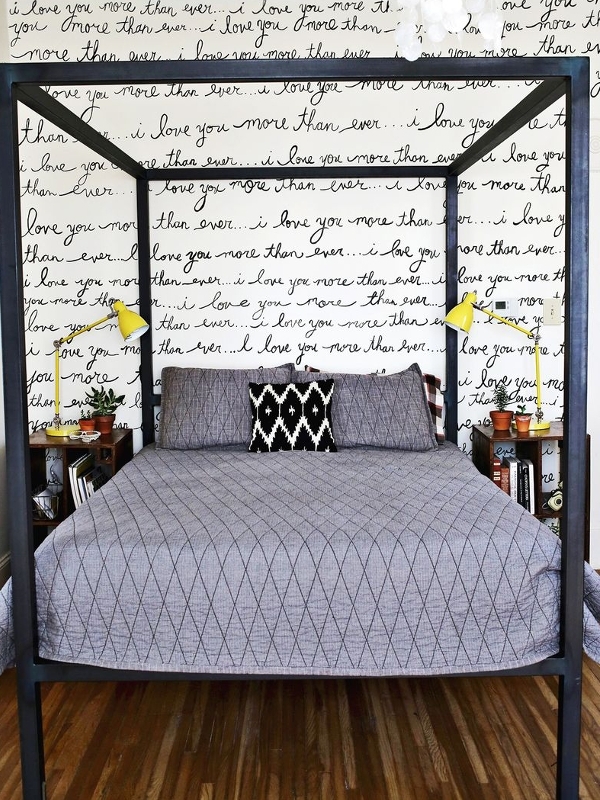 Finally, a steady hand and a sharpie pen is all you need to create this DIY handwritten accent wall – a lovely idea for a bedroom, don’t you think? This more “grown-up” bedroom uses a wall of mirrored cupboards to great effect: a stylish and practical feature that also adds a glam element to the room. 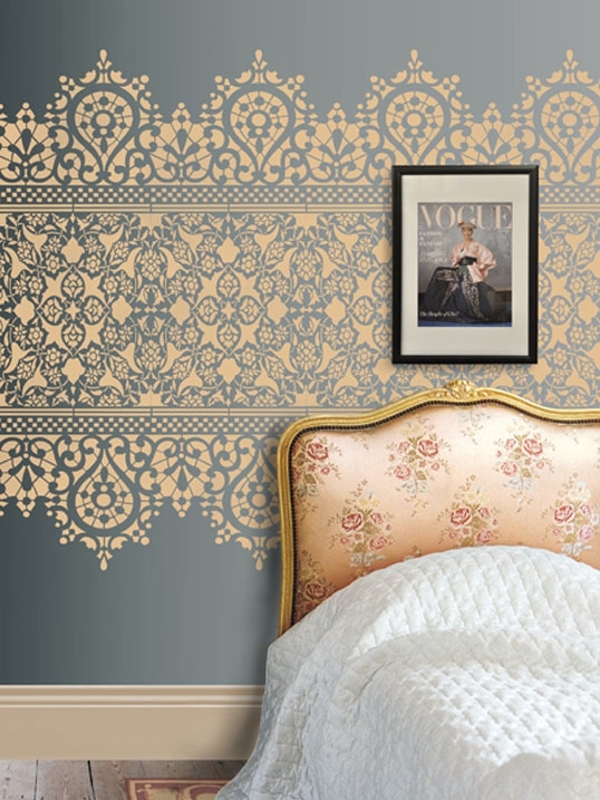 Ramp up the glamour and luxury in your bedroom with an upholstered accent wall! If you have a careful DIY hand, this is not a too tricky style to achieve yourself; the key is to use a sumptuous fabric like this faux suede.